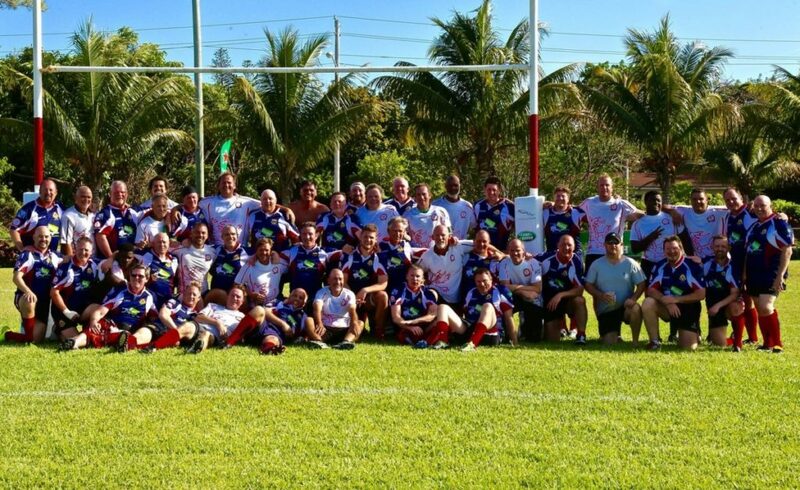 FRFC won yesterday in the Bahamas Cup 15 -12 against Cuckoo’s. Photos courtesy of Chris Baker. A full match report will be coming online soon. Freeport hold on to claim massive victory! In one of the toughest Bahamas Cup games in many years Freeport held on to win 25 – 22 against a Cuckoo’s side which were well drilled and intent on keeping their winning start to the season. With Cuckoo’s pack winning most of the scrums Freeport’s backs had to make do with limited ball and the forwards had to make up for the scrums with their loose play. The first half kicked off with Freeport playing extremely well for the first 20 minutes and the pressure soon paid off when Paul Blake went over the game line to put Freeport 5 – 0 up. With several new players in their side Freeport continued the pressure and with a quick line out taken by George Walker (playing his last game for Freeport), Alex Jeavons somehow dodged two tackles and sprinted across the line. Leading 10 – 0 Freeport started to lose the scrums and Cuckoo’s used their strength and kept the ball in the forwards soon scoring to cut the lead to 10 – 5. With Canadian Ron, Perkins Joseph and Jackelo Pierre causing havoc in open play Freeport’s backs soon looked in a class of their own with some slick moves and great tackling. New boy Michael Watkins, Edwin Joseph and Robbie Butler proving a wall of defense a great run by Denny “the judge” Osias put Freeport 15 – 5 ahead at the half. The second half started with Freeport against the wind and Cuckoo’s piling on the pressure with their forwards and soon scored with a superb push over try to make the game 15 – 10. With Dan Woodside covering acres of ground Cuckoo’s started to turn the screw and with injuries to both sides subs were coming on with regularity. With several kicks being missed by both parties the crowd grew nervous when Cuckoo’s scored again and the game was tied at 15 – 15. Marco Blacks, Andrew Bell and KC Charlton worked hard in the pack to get some ball for Freeport and off a scrum the lively Perkins Joseph stole the ball and scored to the delight of the crowd, 20 – 15 Freeport!!!!. The next ten minutes proved very tough with some big hits and great tackles, however, with 10 minutes left both sides lost players with Brian Simms and Rob Speller being sinned binned for violent play! With the minutes ticking away and the subs of Ricardence Michel and BJ coming on for Freeport the scene was set for an epic finish. With two minutes left Cuckoo’s scored when a kick from John Lane was charged down and Cuckoo’s amazingly made the kick to lead 22 – 20 and Freeport seemingly had let the game go. However in the last seconds and with a penalty to Freeport the Man of the Match John Lane made the decision of a lifetime and gave the ball to Canadian Ron who powered over the line to win the game 25 – 22!